Alexander Baburin was born 1967 in Gorky (now - Nizhniy Novgorod), Russia. He started to play chess when he was about eight years old. In Russia he travelled a lot to various chess tournaments, became a Soviet Master when he was 20 and got a IM title at age of 23. Then in his first GM tournament he easily made a GM norm and thought that the rest would just follow - but GM norms just escaped him! Things changed in 1995, when he achieved a performance norm in Groningen. 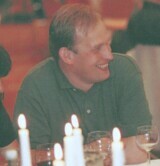 In 1996 he was awarded the GM title in Yerevan. His opinion about this: "As I was 29 then, it hardly looks impressive nowadays, when you are expected to be a GM by the age of 12! Yet, as I never had ambitions (illusions?!) that I was born to be the next world champion, I take it easy." Since 1993 he lives in Dublin, Ireland - and he likes the country. He often travels to Russia, where he has many friends and his parents. He is married to Elena with two children - Ivan and Anastasia. Other English texts on this homepage: The Scotsman by John Henderson, the English texts by Hartmut Metz.